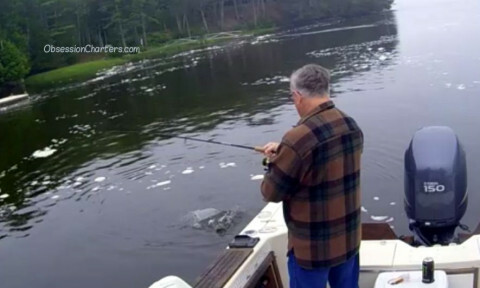 Conditions: There is a large abundance of bait in the Kennebec. Water temps range from 57* to 68*. Water clarity and water flow are average for late June. We are finding stripers feeding on the surface daily but the action is less predictable than in past weeks. The fish are ranging in size from 14"-26" with a few bigger ones here and there. We are averaging 30 fish per trip right now on fly and spinning gear. 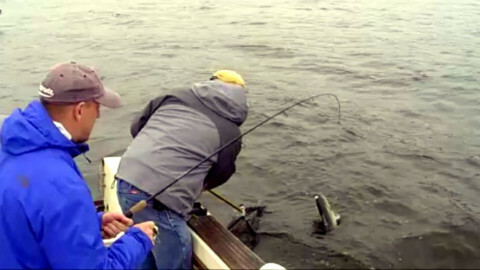 Fishing tactics: The schools of stripers are on the move throughout the lower Kennebec. 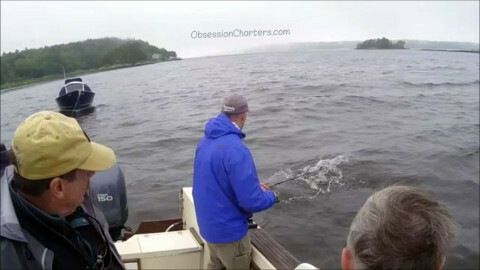 They are feeding on a variety of baitfish ranging in size from 2" – 6". Success requires searching out schools of striped bass and then identifying what they are feeding on. My Fly fishing tip of the week: The striped bass are becoming more selective due to the huge abundance of bit in the River. Start by "matching the hatch" if that fails trying going to a larger fly. If that fails change to a bright color like yellow or chartreuse. My spin fishing tip of the week: If the stripers are feeding on small bait try using metal lures or bucktail jigs of similar size. 7 day outlook: The next week will provide great striped bass fishing. A front will move through on Tuesday. The showers and wind will diminish as it passes.